It turned out we were dead wrong. OpenText engineering was popping. Here are the highlights – and because there are many, there won’t be much detail. If you would like to discuss any of these new developments, please give us a call. OpenText will shortly be able to provide complete integrated suites of solutions. This is an enormous accomplishment and at least on par with, say, the Microsoft Office suite. After many years of acquiring dozens of products and conducting piecemeal development, OpenText had a large stable of products, some of which got love and some of which were nearly ignored. For every snappy UI, five looked stale. More than a few had marginal integrations with other OpenText products. Suite 16 (Content Suite), includes Content, Process, Experience and Analytics suites and a rapid development platform, Appworks, that creates apps that work on multiple devices and platforms and integrates Suite 16 and Cloud 16. Cloud 16, includes cloud (mostly hosted) versions of the above suites, plus the fully SaaS Business Network (the GTX acquisition). OpenText spent more than $300 million to develop the suites over the past 18 months. As of Content Suite version 10.5, Content Server’s UI suffered from having a busy page, too many clicks to complete simple actions and too many page post-backs (waiting for page to reload after a button click). 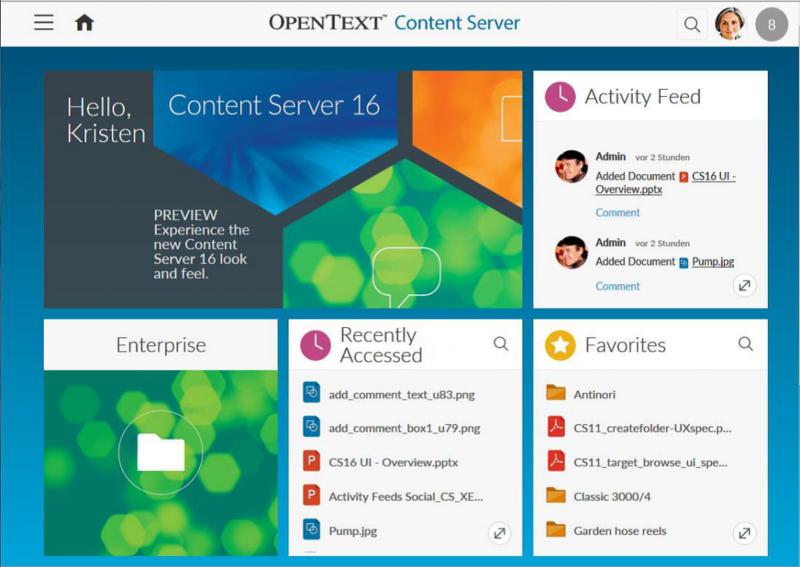 There’s a new Content Server user interface – new, very clean, easy, role-based, with an almost intuitive UI for OpenText Content Management Suite. This is an evolutionary leap toward better user adoption. OpenText CEO Mark Barrenechea said in the keynote address that Suite 16 is as easy to use as SharePoint. We disagree. Suite 16 is easier to use than SharePoint. We have been waiting and watching the development of the new UI over the past two years, and have participated in the innovation lab in past Enterprise World events providing our feedback in the direction of increased user adoption. In the new interface, it takes a single click to view all document metadata including category attributes. The new Perspectives feature allows configuration of a role-based landing page that is designed to show the user’s relevant data on a single page. Administrators can drag and drop the widgets on the page, including Recently Accessed, My Favorites, and My Assignments. For many years, OpenText had a slew of SKUs that were supposed to provide targeted business and technical solutions. Many of them were one-offs. Your kids could grow up and get married before you could find someone at OpenText who knew what they did, let alone demo some of these dinosaurs. OpenText has made a big shift here, as you can see from the examples, below. Producing complex reports and analytics used to require third-party tools. Not any more. This past year, OpenText acquired Actuate, a big-data analytics engine and integrated it across their product line. In Content Suite, Media Management, and Customer Communication management, you have the tools to analyze how customers produce and consume content and process information. In addition, operational analytics and big data predictive analytics are available as an integrated application. Process Suite, the new workflow suite, is close to ready. After years of almost annual changes to its workflow strategy, OpenText has committed to Process Suite, which combines the technologies the company has acquired over the past five years, including Metastorm, Case 360, and Cordys. Process Suite has Entity Modelling layer. Entity Modeling provides an easy way to generate process applications without any coding. We played with this a bit. It was quite impressive. Process Suite fully integrates with Content Suite Archive Center, Media Management, and Capture Center, and now includes a fully-integrated case management solution. Finally. Our initial experience with it is very favorable. New developments from the GXS B2B platform acquisition include Automated Procure-to-Pay business processes and solutions, including Active Orders, Contract Management, RFx Management, and Vendor Invoice Management. OpenText has a cloud version of Archive Server called Archive Center. You can deploy an enterprise archiving service in the cloud, accessible to your entire organization, for your email, SAP and Microsoft SharePoint content, your documents, media files, and data. Suite 16 and Cloud 16 integrate with Salesforce and the HR application, SuccessFactors, in addition to SAP, Oracle, and Microsoft (old news). Extended ECM provides integration with Salesforce with new interactive forms for personalized applications such as letter, quote, and invoice generation, as well analytics for CRM. Content Server 10.5 has been tested and certified and is available today as a VM on the Microsoft Azure Marketplace. eDOCS is in the process of being certified. Starting with Suite 16, OpenText Core (a real SaaS architecture) will replace Tempo Box for external document sharing and collaboration. Currently, its functionality is about a quarter of Box, but it is integrated with Content Suite and provides strong security. Further enhancements are underway to Core, including DM metadata, desktop sync, Active Directory support, advanced version control and more alignment with Content Server permissions model. 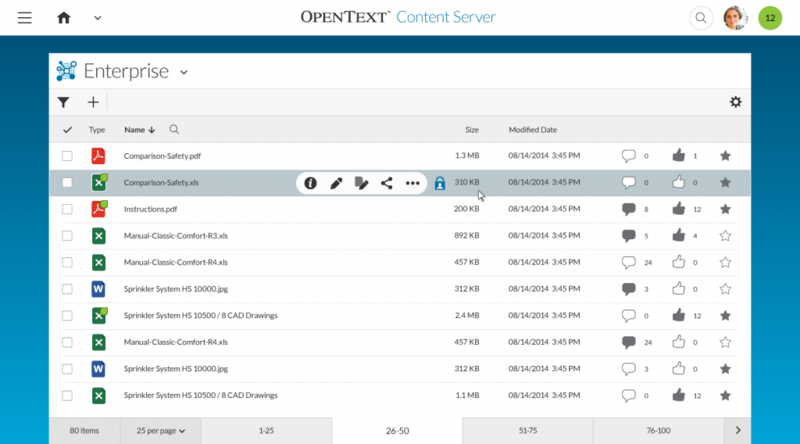 It looks like OpenText is adding eDOCS functionality to the Core product. You get the picture. Over the past year, OpenText products have gone through enormous changes. We would be glad to help you figure out how these might impact your planning and solutions roadmap for your organization. You can reach me, David Horwatt, at dhorwatt@gennet.com or (818) 330-7513, or visit www.gennet.com.